“Namaste.” Our yoga instructor said, bowing before us from her seated position on the floor. Namaste, she explained, meant that we recognized the light within ourselves and the light within others. I bowed in response, repeating the phrase as someone flipped on the lights. Blinking like a post-apocalyptic-mole-person, I yawned and begrudgingly rolled up my mat. I didn’t want to leave class yet, but Senior’s Strength training was about to begin and the room was soon flooded by sixty-year-olds who were as devoted to ‘their spots’ as they were to Regis Philbin and Moons Over My Hammy. “Great class," said a guy who had been seated next to me. I looked him over in the light. He was classically beautiful, bronze and sculpted, like one of those guys on the cover of romance novels. I imagined his name was Duke, or Jake, or Pierce. Or Steel. "Sure was," I agreed as we filed out of the room. Though I had only been taking classes for a few weeks, I was really beginning to enjoy my sessions. In fact, I was enjoying them so much that I was in danger of becoming one of ‘those people’, that annoying group of gym-goers who continuously reminded others of how out of shape they are and how exercise could save their lives. 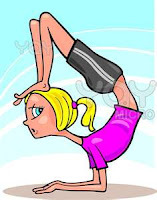 Only yesterday I had caught myself explaining to an unsuspecting woman at the grocery store how Downward Dog could help with both unwanted back fat, sciatica, and possibly herpes (though the jury was still out on that one). I would have to check myself. I wasn't always the Yoga Goddess I now claim to be. I’m not an exercise enthusiast by nature. In fact, I hate working out. But as my short frame is always one Snickers Bar away from hobbit town, I’m forced to move it. Thus, if there’s a shortcut to getting in shape, I’ll take it. The Thigh Master and The Shaker Weight will always hold a special place in my heart. It seemed natural that a slacker like me would eventually stumble onto Yoga, and then one day while picking up my husband from the gym, it happened. As I was scanning the room I happened to see a group of fit, relaxed looking people emerging from a classroom. They had muscular arms, braided hair, and casually discussing chimichangas. They all carried mats like the kind you see Kindergartners nap on. Best of all, at least half the group was wearing Flip-Flops. “Who are they?” I asked my husband when I had finally located him. I had never seen people like this in the gym before. If it wasn’t for their toned legs and tight abs, I would have thought it was a special class, kind of like a ‘take your couch potato to workout day’. “Oh, the Granola Group,” he said, dabbing his forehead. He had just run an hour on the treadmill and was in danger of melting. “What do they do?” I watched as a woman unloosened her braided hair and it floated out around her. It was so long I could almost climb it. "Do you ever do it?" "Me?" My husband's chest puffed out with manly pride and I regretted my question. The next day, sure that I had found my mother ship, I headed in, new purple mat tucked under my arm. My first lesson in Yoga was that mats weren’t cheap, especially the cute ones. I spread my mat near the back of the room,with the other yoga newbies that somehow wandered in. We all looked dazed and amused, like we had just wandered into a high school class that was famous for giving out passing grades even if you didn't do your homework. In front of us, I later learned, were The Middlers, they were the drama geeks of the group, trying to pass themselves off as yogis, but not quite cutting it. And at the top of the ranks were The Front Row Yoga Divas, the popular group whose bodies seemed to be made from limp spaghetti. If you got in with them, you were golden. The class started out well enough, lights out, relaxing music. We spent the first minutes sitting cross-legged, palms up, breathing in and out to the sound of Gregorian Monks, and I tried to play "Name That Chant". Our instructor informed us that this relaxation technique this was helping our bodies to do good stuff: repair cells, lengthen muscles, and align chakras (I wasn’t sure what a Chakra was but it sounded delicious). For fifteen minutes we slowly stretched our shoulders, our neck, our sides and our legs. Our instructor gave us permission to block out the worries of the day. This direction left me a bit anxious. Without my worries, I wasn’t sure I was me. When I had finally found my rhythm of breathing and stretching, things changed. Our instructor had suddenly transformed from Gandhi to G.I. Jane. “Okay, people,” She bellowed, walking the floor with her hands laced behind her back, “now its time to work. And I mean work.” She forced us from our comfy position on the floor into a position known as plank. In plank position you sit at the top of a push up, but you don't go down. You just hover there. Indefinitely. I’m pretty sure it originated during the inquisition to get witches to confess. I wasn't sure how holding one position without moving could hurt so much, but it did. Sweat beaded across my forehead, and my arms began to tremble. I was going down. The instructor must have spotted my weakness. She moved towards me like a lion on a zebra. She placed her bare foot under my hovering body and warned me not to let my body lower onto hers. Somehow I held strong, wondering if I could crush the bones in my arms with the weight of my own body. “Hold for five more breaths,” she said. I could feel myself whimpering. Then, mercifully, she had us change position. For thirty minutes our instructor pushed us into positions that not only seemed bendi-logically impossible, but that also worked muscles I forgot I owned. At every new pose: Warrior 1, Warrior 2, Side Plank, Triangle, I thought my body was going to dissolve. I could already see my tombstone: April Aasheim. Survived giving birth, her husband’s driving, and late night Denny's runs. Was eventually done in by Downward Facing Dog. 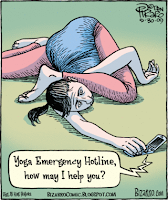 Yoga, I learned, wasn’t a workout for slackers,. Yoga hurt. And that ‘chimichanga’ thing I heard people talking about wasn’t a yummy deep-fried burrito. It was actually called a Chaturanga, a sinister pose where you lowered your entire body near the ground and just sat there, an inch or two above the ground. Just another method of torture in my instructor’s ever growing arsenal. I had made a horrible mistake. During Standing Splits I decided I couldn't take anymore. I knew when I was licked. 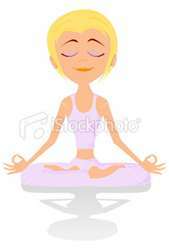 The moment my instructor looked away I would sneak out of class, mat tucked between my legs, and tell my husband that I couldn't take yoga because it would interfere with the existential meditation courses I had pretended to sign up for. But before I could make the break, something wonderful happened. Our instructor called for the final pose: Shavasana. I heard a collective sigh from around the room and watched as everyone flopped onto their backs, legs stretched, arms splayed, and eyes closed. They all looked dead. Finally, something I could do. Our instructor turned on Johny Mayer's Gravity and I decided to join them. She had us breathe deeply, focusing on each muscle in our body, tightening it, and releasing it. When I was fully immersed in the nothingness she spoke, her voice soft and gentle again, as she read from The Book of Wisdom. She said to imagine what it would be like to live in a world where everyone loved everyone and there was no judgment, only peace and cooperation. It sounded lovely and I began to imagine such a place, much like the little Sims town I had built a few weeks before. She then prompted us to sit up and bow, and she thanked us for sharing our hour with her. I stretched and rubbed my eyes, realizing that I was doing something I had never done in a gym before. I was smiling. I started attending class regularly and before long I was doing things I never thought I was capable of doing: back bends, lunges, and one-legged balance poses. I was also holding Plank for more than thirty seconds without puking. My shoulders began to get rounder, my abs began to firm, and the waddle under my arms that I’ve had since I was a fetus, began to vanish. I’m as surprised as anyone about how much I now love Yoga. It’s a harder workout then I had realized, but I leave each class relaxed, and smiling, and ready to take on the world. While I have not quite joined the ranks of the Front Row Yoga Divas, I have inched my mat up towards the Middlers. From this position, I can look ahead to what I will be capable of one day, and behind to those foolish newbies who, like me, wandered in hoping for an easy A.